Does your dog have ‘accidental leakage’, have a habit of wetting the bedding or wet hair at the lower abdominal area, then it will need the assistance of Better-Bladder control granules. The Better-Bladder Control granules help relieve this incontinence. It is a natural remedy to reduce these dribbling accidents and also to strengthen the bladder muscles to have more control. The sphincter muscles located near the urethra are strengthened as well. The muscle control will reduce over the age and also due to reason such as obesity, some lesions on the nervous system or brain cells, some inflammatory diseases etc. There is another reason that there might be underdeveloped bladder. The Better-Bladder Control granules can strengthen the muscles and relieve the incontinence that is caused by reasons of muscle malfunction. The Better-Bladder Control granules are very convenient and are easily dissolvable in the food or water. It makes it easier to administer to the dogs without any fuss. Cantharis is being used to alleviate urinary tract infections in dogs. The effect is tender and is suitable for shy dogs. This remedy works well also to support the bladder health and improve the muscle control. Causticum is another remedy for urinary tract disorders. It is useful in avoiding these pet related accidents, which often connected to sneezing or barking. 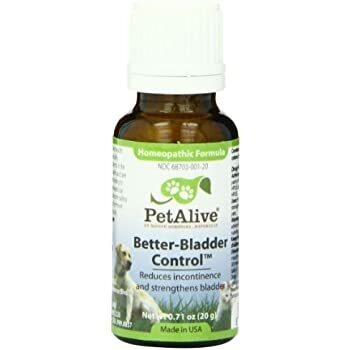 This works well for older dogs that naturally have weak bladder muscles. Equisetum is an herb that is used to null the pain in the bladder. This herb works well for all those dogs which have frequent urination by diseases, discomforts or by their habits. Whatever the cause is this herb can put a stop to the incontinence. Ferrum phosphoricum is a tissue salt that can take part in early stages of urinary infections. It provides better energy and elevates the low energy rate. It supports the bladder health as well. The Better-Bladder Control granules are very convenient and are easily dissolvable in the food or water. It makes it easier to administer to the dogs without any fuss. The granules can be sprinkled into the food or water for the pet or administer directly on to its mouth. The dosage is to be given every 30 minutes for a maximum of 10 times, initially. Later on reduce the dose to only 3 times a day. The amount of granules is to be 2 pinches or ¼ cap depending on the size of the dog. The doses are for dogs 20-50 lbs and for others that are over 50 lbs respectively. Better-Bladder Control granules work faster and brings positive results right from the first dose and the frequency in the accidents are gradually reduced. The longer delay might be for 3-5 days maximum before showing relief. A single bottle is enough for a month, depending on the dose and size of the dog. There are deals while ordering the Better-Bladder Control granules which allow having regular supply delivered. Use Better-Bladder Control granules to have normal bladder emptying and help remove the excess toxins. Frequent urination results in the loss of some essential salts also. to avoid the situation give your loved canine friends this natural product.